We Persian speakers have a common idiom, Khaste Nabaashid, and usually say it to someone who finished a task or is in the middle of doing that. The literal translation of the idiom is something like don't be tired or I hope you do not feel tired. Most of time non-Persian speakers who learnt Farsi become confused when we say them Khaste Nabaashid. So, I think there is no equivalent for that in other languages, specifically English. Is there any idiom that conveys this? Update: I just read somewhere, the equivalents may be nice job or well done! However, I'm not OK with them. Update 2: As a given scenario, it could be used as greeting! When we see a friend who's doing some work, we usually say, Salaam (Hello), Khaste Nabaashid! Moreover, if she/he is doing something for us, the idiom conveys our appreciation, otherwise it's used as some type of admiration. Update 3: This expression implicitly signals the end of the work. For example, when students are tired and want to indirectly and politely ask the teacher to stop and end the course, they usually use this expression and tell him/her Khaste Nabashid! but this song from 'Life of Brian' would show that I really meant it. Keep up the good work is a common expression which sounds like it has a similar meaning (reference). But it might carry more weight than the Persian phrase does. You'd usually only say it to encourage someone - for example if they seemed dispirited, or to signal that you understood they were performing a difficult task. In more neutral situations, you'd just say something like good job or (in very informal speech) nice one. "you're doing a great job, keep on trucking." In some contexts, "What doesn't kill you makes you stronger" could be used. You pass someone by, who seems busy. 'Hi. Carry on.' can be a greeting. You're done for the day, while your collegue seems stuck. Saying 'Carry on' in the right tone can convey smugness. 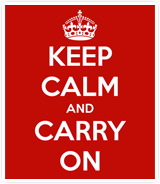 And of course, 'Carry on' can simply be said to encourage someone. Hang in there or Hang on seem to have a close approximation. This is typically said when the task at hand is tiresome or requires extra effort. It is also usually said with a degree of sympathy and motivation. See the light at the end of the tunnel is a phrase that is used to recognize that one is near the end of a task or has completed a significant task that makes any later tasks seem easy to accomplish. The "light" is the goal one is trying to reach (to get out of the tunnel, complete the task). Once you have the light in sight, the hard work or most of the task is done. An ironic parallel phrase is the light you see at the end of the tunnel is an oncoming train. This has the exact opposite meaning of the one above. It means the task is going to become significantly more difficult. The phrase that sprang into my mind? Keep on keeping on. The phrase is catchy enough to have appeared in several musical titles, and it encourages the listener to persist in their toil. Buck up can be used as a form of encouragement. "Buck up, you're almost halfway through reviewing those documents." ...which can be heard on athletic fields across the United States.